“In the town of Castleton in the Derbyshire Peak District. 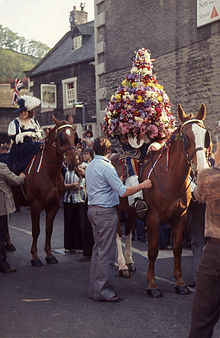 The Garland King, on horseback, and covered to the waist in a heavy, bell-shaped floral garland, leads a procession through the town.” – Per Wikipedia. The garland is said to represent the oak tree in which King Charles II hid after the battle of Worchester in 1660. There is quite the custom that surrounds the ceremony.